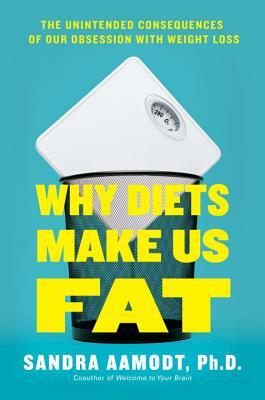 “If diets worked, we'd all be thin by now. Instead, we have enlisted hundreds of millions of people into a war we can't win." What’s the secret to losing weight? If you’re like most of us, you’ve tried cutting calories, sipping weird smoothies, avoiding fats, and swapping out sugar for Splenda. The real secret is that all of those things are likely to make you weigh more in a few years, not less. In fact, a good predictor of who will gain weight is who says they plan to lose some. Last year, 108 million Americans went on diets, to the applause of doctors, family, and friends. But long-term studies of dieters consistently find that they’re more likely to end up gaining weight in the next two to fifteen years than people who don’t diet. ·Telling children that they’re overweight makes them more likely to gain weight over the next few years. Weight shaming has the same effect on adults. ·The calories you absorb from a slice of pizza depend on your genes and on your gut bac­teria. So does the number of calories you’re burning right now. ·Most people who lose a lot of weight suffer from obsessive thoughts, binge eating, depres­sion, and anxiety. They also burn less energy and find eating much more rewarding than it was before they lost weight. ·Fighting against your body’s set point—a cen­tral tenet of most diet plans—is exhausting, psychologically damaging, and ultimately counterproductive. If dieting makes us fat, what should we do instead to stay healthy and reduce the risks of diabetes, heart disease, and other obesity-related conditions? With clarity and candor, Aamodt makes a spirited case for abandoning diets in favor of behav­iors that will truly improve and extend our lives.